Sean Rossman, & Karl Etters. From 11 Alive News. Posted on July 2, 2016. Original article. Five people, including at least one child, are confirmed dead after a bus collided with a semi truck in Wakulla County. Four people died on scene and another died at a local hospital, said Wakulla County Sheriff Charlie Creel. The sheriff said 25 more people were taken to the hospital. The driver of the semi truck died later at the hospital. At least one of the injured was airlifted from the scene. 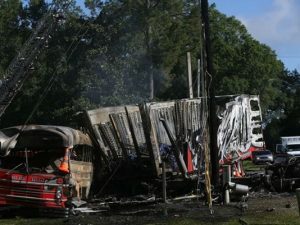 The former school bus, which was filled with children and adults, was traveling southbound on Woodville Highway at about 5 a.m. when it ran a flashing red light at the intersection with U.S. Highway 98. The bus then collided with a westbound semi truck. Creel said three of the dead were on the bus and another was the driver of the semi. He’s calling it the worst accident he’s ever seen in the county. Florida Highway Patrol Capt. Jeffrey Bissainthe said there were 30 to 35 people on the bus, which was from Georgia. Bissainthe said he was unaware of where the bus was headed. Following the crash, several people on the bus ran away from the scene. The semi truck disintegrated in the crash, which knocked down a power line, and all that remains is the engine block. Bloody medical gear, pillows, coolers packed with food and drinks and clothing litter the road as fire officials try to extinguish any remaining fires within the two vehicles. The bus caught fire, Creel said, and the entire inside is burned. Some of the injured were taken to Tallahassee Memorial HealthCare and Capital Regional Medical Center. A bus traveling from Georgia to Flordia collided with a semi truck on Coastal Highway in Wakulla County Saturday morning leaving five people dead and dozens more hospitalized. Saintervil Amilcar of Bainbridge, Georgia, drove to the scene after hearing of the wreck this morning. He said his aunt was on the bus. He doesn’t know if she’s dead or alive. Amilcar said the bus was filled with Haitian migrant workers, who were on their way from Bainbridge to Belle Glade, where they were going to work for two weeks. After they worked in Belle Glade, they were going to head north to find more work. He said another bus of workers was expected to leave Bainbridge for Belle Glade this morning. Creel said earlier that passengers found on scene were unable to speak English.